﻿St. Joseph Day: Calendar, History, Tweets, Facts, Quotes & Activities. The feast of St Joseph commemorates Joseph, the husband of the virgin Mary and Stepfather of Jesus. Joseph married Mary and later discovered that she was pregnant. Knowing that this child was not his own but not wanting any harm to come to her, he sent her away. Joseph only brought her back when an angel came to him in a dream explaining that the child Mary carried inside of her was conceived from the Holy Spirit. It is believed that Joseph died before Jesus began his public life as an adult as there is no mention of Joseph in the bible after Jesus' childhood. The feast of St. Joseph is celebrated annually on March 19th. Joseph is noted in the Bible for being a direct descendant of King David in the Old Testament, which gives him a royal lineage (Matthew 1:1-16, Luke 3:23-38). 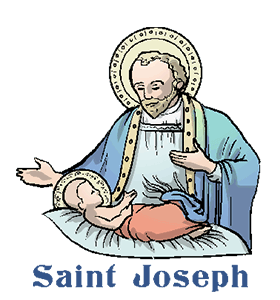 St. Joseph actually has two feast days in the Roman Catholic Church. The March 19 date celebrates him as husband of Mary. He is revered again on May 1 as a worker. In the Orthodox tradition, Joseph is revered during the Great Feast of the Nativity of Our Lord in September. St Joseph is the patron saint of the dying and of carpenters. Practice carpentry skills to build something. Jesus is known as the son of a carpenter, or builder. Saint Joseph is the patron saint of carpenters. Investigate your lineage. Genealogy can sometimes yield interesting information about where we came from. Maybe you come from royal lineage, too! Joseph raised a child that was not his own. Thank a man who has served as a father for someone else's children. Enjoy Italian food in St. Joseph's honor. He is one of the most beloved saints in Italian-American communities. Visit an Italian Bakery and pick up some delicious St Joseph's bread (Pane di San Giuseppe). St. Joseph's Bread is typically made with egg and has a thicker crust. It is often marked or shaped in a cross.